The C70A series has been discontinued. Please contact our Flow Engineering department. 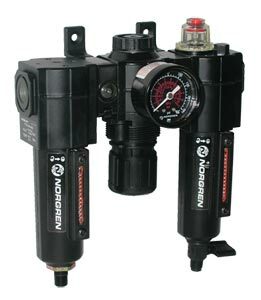 The C72A Series Air Line Air Filter-Regulator-Lubricator Combination Units are designed for use as a single in-line unit or as part of Norgren's Excelon® modular compressed air preparation supply system. As a modular component, this filter-regulator-lubricator can quickly be attached to smooth start / exhaust valves, safety lockout valves and pipe adapters. With our Quickclamp® and Quickclamp® and wall bracket accessories, a complete compressed air supply system can be assembled and mounted in minutes. The C72A Filter-Regulator-Lubricator combination units come in Micro-Fog models for pneumatic applications containing one or more points of lubrication. Uses include lubrication of cylinders and air driven devices like air line tools or pneumatic screwdrivers. 참고: Models include PTF threads. Filter includes automatic drain, transparent bowl without guard and a 40 0 µm filter element. Lubricator is a micro-fog model with 1/4 turn manual drain and transparent bowl without guard.